Stage director Steven Goldstein’s take on The Magic Flute, running at the Emerson Cutler Majestic through Tuesday, makes an Enlightenment case for respecting operatic precedent. Nothing in his witty, original approach would have annoyed (or even surprised) Mozart or Schikaneder, and at the same time freshness prevailed. How was this possible? Should other opera companies take note? 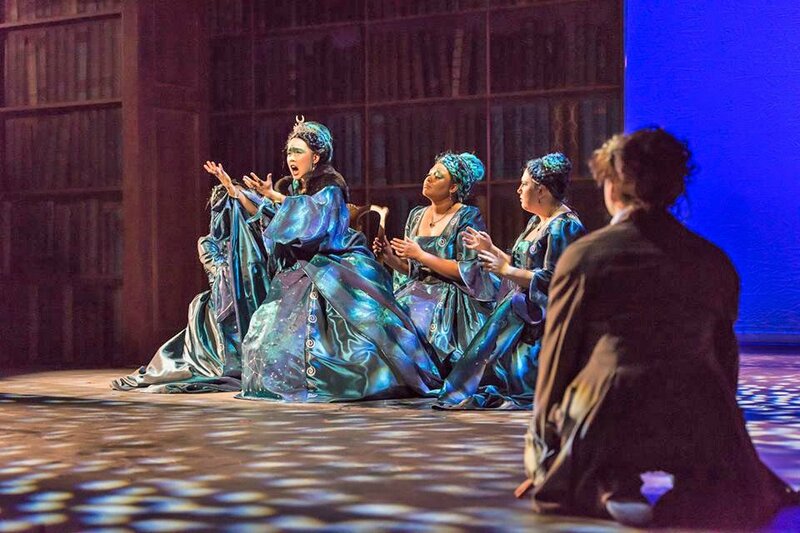 On Saturday’s opening night, the scene unfolded within the elegant 18th-century confines of Prince Tamino’s library. Jon C. Savage’s wing-to-wing and boards-to-fly bookcases represented Tamino’s and Sarastro’s quest for truth and wisdom, in a celebration of the power of books. We discover the prince, deeply engrossed in a printed tale, imagining himself within a frightening mythical scene. Octavo editions and elephant folios form the scales of the dragon that inspires his terrified cries of “Zu Hilfe.” Seiyoung Kim represented the prince with a fine lyric tenor that rose satisfyingly to the top of his range, although he lacked dramatic stature (especially in scenes with a Papageno a head or two taller) and command of English (the dialogue) or German (the arias and ensembles). The three ladies, Amani Cole-Felder, Rush Dorsett, and Whitney Robinson, matched tones as nicely as Brooke Stanton’s evocatively operatic turquoise gowns coordinated with matching bindings in the bookcase set. The men’s period outfits in earth tones also found counterparts on the shelves. In the movements that Goldstein blocked for them, they became a single three-part swashbuckling force, ready to reward and punish. The library gained some mystical trappings such as trees of knowledge (papier–mâché printed pages), as Papageno, making his nature-manly birdcatcher entrance in the bewigged Roger Daltreyesque person of the tall Taehwan Kim, commanded the stage with naturalness and star power. Kim’s pleasant, even, unforced baritone served the musical theater demands perfectly, and his embodiment of the charmster became completely his own, neither flighty nor overbroad. Again, though, some years of language coaching might help him convince in roles that require him to put across words in vernacular English and idiomatic German. The bookcase parted to reveal the Queen of the Night before the inevitable midnight blue background. With pinpoint aim Yoonjeong Yoo fired the coloratura, although her characterization lacked the heft of a woman scorned. Goldstein deployed the Queen, Tamino and Papageno with convincing business: everyone always had something to do. Chris Hudacs lighted the players and set with sensitivity to color, emotion and rhythm. He added three-dimensionality to the drops through a variety of lighting angles: from borders, overhead battens, the house and, to surprisingly dramatic effect, from footlights. Monastatos lacked menace in his mélange à trois with Pamina and Papageno. Since it’s no longer PC to portray him as a menacing moor, some other stratagem must convey his outcast fury. Corey Hart, in essaying a cringing Loge type, put the notes across whiningly. Pamina or Papageno could have dispatched him with a wrist slap. Perhaps because he was short, Stanton dressed him Napoleonically. 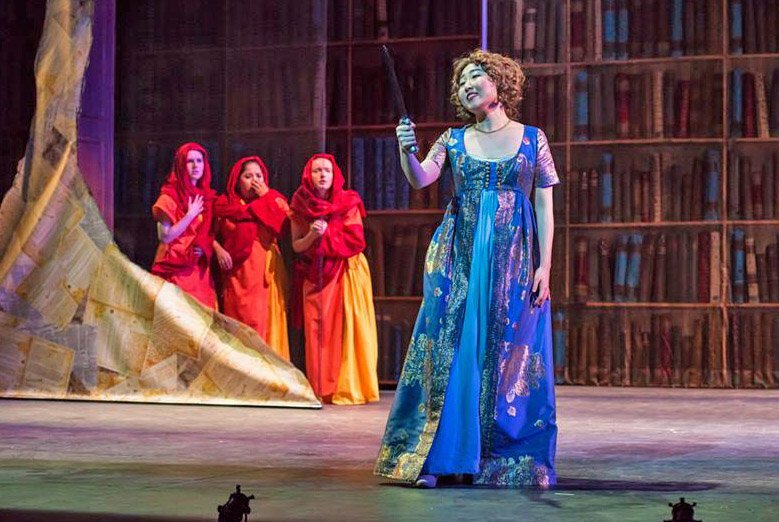 Christine Oh’s Pamina brought a most noble heart and pipes to the stage last night. Her part in “Bei Mannern” inspired even Papageno to yearn for godliness. Sending soaring gleaming silver shafts on the words “die Wahrheit” she dramatically set up the encounter with Sarastro and the priests. Later, her consoling rendition of “Ach ich fühl’s” stole the show, as it should. Since no boy sopranos have enrolled in the NEC opera program, three women stood in with a well-sung but dis-spiritsing simulacrum. It didn’t help them to be dressed in flame orange and yellow, veiled as if for a church Nativity pageant. Sarastro, voiced by guest artist Christopher Carbin, expounded the low notes with dignity, if not authority. His fellow priest Kyle Bejnerowicz got the walk and talk of an old truthseeker spot on, and in warm tones that left us wanting more, especially of his excellent German. We also looked to him whenever the excellent chorus of priests brought us to attention with their refined but emphatic vocals. Papagena (Julia Dwyer) transcended the mere pa-pa-pa-patter in “Welche Freude” to become the dove of us all. Shoutouts to both the Vogelfänger’s folded paper birds sported by nearly invisible puppeteers and to the cutout hedgehogs and their fellow easily enchanted creatures — Flûte Enchantée indeed. One carpium: The ordeals of fire and water neither inflamed nor immersed. Nor did the fire enlighten or the water quench as Goldstein suggested. Conductor Douglas Kinney Frost, experienced but new to us, is an opera pro. Considering the instrumental talent enrolled, it was not surprising that NEC’s 27-member orchestra responded well to his romantic and detailed take. From the patient opening of the overture through the rapid fugal figures that followed, and on through all of the arias and ensembles, the players attended to Frost’s demanding cues, supporting singers and composer alike. Dynamics and tempo changes meshed between pit and stage quite well, aside from a few opening-night miscues. Frost enrobed Mozart’s score in modern orchestral dress, resorting to none of the fuss that accompanies perioder-than-thou versions. In fact, this show provides satisfactions that many bigger-budget professional companies fail to supply with their often relevanter-than-thine conceits. Catch it Monday or Tuesday, 7:30pm. That may be your opinion and you’re entitled to it of course. Mine is that the reverse is true. You can’t prevent music critics who survive you from putting words in your mouth. oops…Mozart would have put a period after “librettist”. I enjoyed the performance. To me there were a number of good singing performances, but often slightly uneven. The standout voice, although briefly heard, was Papagena’s, with wonderful purity across her range. Definitely worth seeing and a great value. Yes, I saw this production because I needed to see a “normal” Flute, having managed to see the Glimmerglass Festival’s Flute in 2015 (from the light booth–long story) which was a modernized version set in a forest in Upstate/Western NY and I suspected some parts were changed/missing; Francesca Zambello may have had a a hand in that one. This Flute was a straightforward production that would have been conceivable for the 1790’s and I suspect was all there, so my purpose of seeing a “normal” Flute was amply rewarded. Yes, there were problems in diction; yes, this is probably a student production. The orchestra was excellent. Yes, trying to get Moral Lessons and Life Purpose out of Flute can be a challenge in the ordeals; what came out perhaps was perhaps playful burlesque of fraternal organization ritual rather than any deep philosophical lessons. (There may well have been a genre of burlesque of opera seria pretentiousness wherein serious sounding arias were immediately followed by travesty of same, Haydn’s Orlando Paladino an example. We would do such satire differently today.) In short, this was a Flute to go see and hear. Finally, my apology to the Mozart people. For 3 decades I have been describing Cosi as the most boring opera every written. I suffered through Castle Hill’s 1984 Peter Sellars-led production that started at 8:45pm and with two intermissions finally ground to a halt at 1:20am; never figured out if it had finished or they just gave up. I have described it as at 4.5+ hours “being at least seven hours too long”. It featured a toy-helicopter carrying procession down the hill in the developing fog among other things and was set in a 1950’s-era diner supposedly. The rolling-in fog got into the instruments–Catle Hill in Ipswich is on the sea. So I went to BosCon’s Cosi to see if Cosi was still so awful. I must now admit that Cosi is not tediously dull–except in a short stretch in the second act. Now maybe the BosCon decision to place it in 1905 Naples, Italy made it work, or they pruned Cosi a bit (BosCon was done in 3 hours with one intermission), but this was an entertaining and not dull Cosi. No, the crown for Worst Opera Ever falls to Gunther Schuller’s “The Fisherman and His Wife” as done by Sarah Caldwell ca. 1970 which we left before it had ended–as did much of the audience.